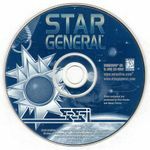 Star General is a strategy video wargame. It is one of SSI's popular hexagonal-movement games that bases its story setting on The Fleet, a series of books written by David Drake and Bill Fawcett. The game was developed by Catware and SSI in 1997.